We have never seen most of the neighbors on our street, although they may have seen us. Our landlady told us the retired man across the street has hidden surveillance cameras lining the perimeter of his property. Nothing is stopping him from keeping tabs on our comings and goings, 24 hours a day. Closer by, our friend next-door also has surveillance cameras. She installed them after the elderly couple living on the other side of her house accused her of trying to demolish their common wall at all hours of the day and night. It may have been dementia, but there are other possibilities. Blank walls, like the desert’s blinding light, have the effect of turning one’s attention inward to the heart’s four dark chambers often haunted by past traumas. So when hearing a ruckus while surrounded by high walls, an elderly couple might well imagine an attacker from the past or a movie villain jackhammering in, closer and closer. Walls can make your imagination jump off the deep end. When a house-shaking “BOOM BOOM BOOM BOOM BOOM” thundered through our house late one night, my first thought was, “UFOs landed on our roof!” It was only a weak earthquake. Nonetheless, soul interiors may be scarier for crowd-seeking extraverts than for solitude-seeking introverts who spend their reflective lives constructing comfy rooms within themselves. Before he was elected President, Donald Trump once said he avoided introspection because he was afraid of what he might find. Arizona shares a desert border with Mexico, so a wall directly concerns us. Perhaps nothing symbolizes the current state of America better than a wall. Trump tweeted about building a border wall in 2014, and still rants about it. In the meantime, there is a wall of TV screens blaring conflicting news stories that stands between his base supporters and the rest of Americans. Despite all the cacophony, in my mind I hear a song from nearly 50 years ago, “For united we stand, divided we fall. And if our backs should ever be against the wall, we’ll be together, together, you and I.” But what happens to a divided country—where you and I fear each other—our backs against opposite sides of a wall of “fake news”—all of us imagining demons on the other side? A large part of Southern Arizona (including the Phoenix metropolis), all the way down to the Gulf of Mexico was traditional O’odham Indian homeland. The 1859 Gadsden Purchase created the current Mexican/American border and divided the O’odham between the two countries. Then their homeland was reduced and further chopped into four reservations: Ak Chin, Gila River, Salt River, and Tohono O’odham. My husband David belongs to the Gila River Indian Community. He is Akimel O’otham, which means the “River People.” If this sounds familiar, it may be because Gila River is the home of famous flag-raising WWII soldier, Ira Hayes, and the site of a WWII internment camp for Japanese Americans. The Akimel O’otham grew crops with the help of the Gila and Salt Rivers, and canals they inherited from their prehistoric ancestors, the Huhugam, or “Those who are gone.” Tempe was originally called “Oithbad” or Abandoned Field.” There’s speculation this refers to a field abandoned by the O’odham when settlers pushed them out and/or a field long abandoned by the Huhugam. If the Tohono O’odham (“Desert People”) sounds familiar, it may be because they have been in the news for resisting Trump’s wall. The tribe wants to continue working with government security forces and maintain the current vehicle barriers, but they reject a wall. They argue a wall would block them from water, block them from their relatives (both alive and gone), and block the migration of many animals they hold sacred. Even scientists state Trump’s wall would have a catastrophic effect on wildlife. There is a natural flow that if blocked brings monsters and death. The O’odham do not even have a word for wall. The seven-foot walls around our house work differently. Not having to impress neighbors, I take advantage of our seclusion to give our lawn back to nature. To human eyes, it looks weedy and overgrown; but to animal eyes, it’s a sanctuary, an oasis, a desert paradise. It’s the lawn all lawns secretly aspire to becoming. When we first moved here, I wondered if wildlife would notice a tiny wilderness in the middle of urban sprawl. I sensed they might. Even when we had lived nearby in an apartment complex, we were occasionally visited by mysterious Black-tailed Jackrabbits (Chuk chukwi), tall and leggy as fawns. Almost nothing is more peaceful than watching birds and bugs make themselves at home, because this land is their home too. They bring natural flow and life back to the city. Our walls pose no obstacle to those who can fly or climb. At least 30 different species of wild birds have dropped by. We have seen Turkey Vultures (Ñui) soaring overhead. Ñui is said to have shaped the desert’s valleys and peaks with a sweep of its great wings. Ñui was also the first “person” created and is considered the clan totem/helper to nearly half of the O’odham. Our small sanctuary’s most frequent visitors also have their original names woven into the O’odham Creation Story. In stories worldwide, knowing someone’s “true name” gives one knowledge into their true nature. Likewise, one gains profound power and humbling reverence by knowing the ancient names and myths of the place you call home. When the Creator, Earth Doctor (Jewed Maakai) first created the Earth, it was unstable and shaky. So Jewed Maakai called out to four shuug from the four directions to sing. By singing, they provided the gravity the Earth needed to keep it from shaking and made it habitable. Later, when the Flood came, Shuug was the only bird to sing in the dark watery silence, because it is always cheerful and game to make the Earth livable again. What I love about Mockingbirds, is how diligent they are about alerting others to the presence of danger, mostly from cats. Cats regularly climb over the walls. 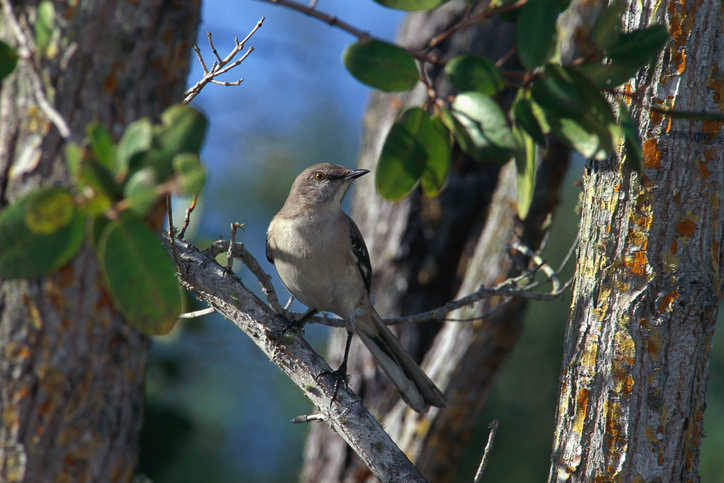 A Mockingbird will make a boisterous show of dive-bombing the intruder and flashing its white wing patches. When I go outside to chase the cat away, Shuug perches on the wall, puffing up its feathers with great satisfaction. During the Flood, in the O’odham Creation Story, Vipismal was one of four birds that survived by holding on the sky with its bill. Jewed Maakai, gave Vipismal the power to make the floodwaters go down by singing. It is said that hurting Vipismal will cause a flood, and then it may refuse to save you. The Anna’s hummingbirds around my house are curious and more aggressive than mockingbirds. They berate us in squeaky rages, inches from our faces. But sometimes when the summer temperatures climb into the 110’s while I’m watering the plants, hummingbirds will whisk puppy-like to and fro through the spray from my hose. Giisobi is a tiny, acrobatic bird with a distinctive yellow head and red shoulder patches. Like Vipismal, Giisobi is one of the four primordial birds to survive the Flood by holding on to the sky. It is considered a powerful shaman who can make people fall asleep as well as call forth torrential thunderstorms. When a deadly drought came upon the O’odham after Tobacco Woman left for the west, it was Giisobi’s heroic journey to her that brought back the rainclouds. ​Pairs of Verdins build multiple spherical nests with twigs and spider webs on the outside, and grass and fluff on the inside. I witnessed one pair move their entire nest twig by twig, grass by grass, and feather by feather to a higher location away from a cat’s favorite lookout spot. Verdins are sagacious, peaceful souls. They watch me when I work in the yard, and follow me around town, singing chip-chip-chip-chip—the sound of a wall wearing away. One reason why Verdins follow me around may be because they are insectivores, and bugs like me as much as I like them. They are safe from the exterminators who show up regularly for other houses on our street. I used to be deathly afraid of many kinds of bugs; now I am an amateur entomologist. What changed me was finding out firsthand bugs didn’t want to hurt me–they just wanted to be left alone to live their little lives. My husband and I once lived in Sedona in a high school student-built house that let in dozens of kinds of spiders, scorpions, centipedes, bees, ants, beetles, crickets, caterpillars, and all possible larval forms. Each time I entered a room meant meeting strange new faces, so I grew accustomed to them. They became like newfound relatives. Similarly, I believe getting to know a wide variety of people may cure racism, sexism, and classism as well. Blocking out those one fears only generates hatred and imaginary demons. The O’odham are right about walls, and animals, too. The Totoñ were the first animals Jewed Maakai created to live on the first plant, the creosote bush. Unfortunately, they may have been too small to help enlarge the Earth so the termites (hiopch) were created. Nonetheless, the spirits of primordial Totoñ are still around today, hiding in the shadows, and sometimes gifting people with “Ant songs” in their dreams. There are several ant species in the yard. Most mind their own ant business. Only one kind of ant attacks unprovoked, leaving me covered in ulcerous lesions that take weeks to heal. I harass these ants with powdered cinnamon when I can’t take their venom anymore, but they always come back. They have every right to do so—they were here before anyone else. I don’t know any O’odham Naksel myths, but I do know the deadliest scorpions in America, Bark Scorpions, thrive around our home. It’s probably because like the birds, scorpions are hunting the plentiful insects. Getting stung by a bark scorpion means 24 to 72 hours of acute pain, sometimes convulsions, partial paralysis, and death. We have never been stung even when accidently stepping barefooted on them. With their fearsome appearance and reputation, one does not expect scorpions to be kinder than ants. I have the most respect for anything that has the power to kill me, but chooses not to. If you look closely at the faces of dragonflies, you might be surprised to find them smiling back at you. These fierce hunters are surprisingly convivial. During the summer monsoons, as the dust storms (jegos) roll in, dragonflies of all colors will ride waves of wind over the wall to shelter in our weedy sanctuary. In that moment, it feels as if a rainbow had come to life. In myths, there is always a border between two opposite worlds. This border is not a wall, but a door in the way twilight is the door between day and night. Often, a hero crosses this border into an otherworld where s/he finds helpers (often animals), confronts monsters, and returns home with an elixir to save a dying land. Perhaps that crazy tapping we hear on the other side of our walls isn’t a monster or even a bad neighbor, but an urgent call to you and I to heal our divided world. Sharon Suzuki-Martinez’s first book, The Way of All Flux, won the New Rivers Press MVP Poetry Prize for 2010. Her work has recently appeared in Gargoyle, South Dakota Review, Duende, Okay Donkey, and elsewhere. She has received Pushcart and Best of the Net nominations, was awarded a residency to the Anderson Center at Tower View, a fellowship to Kundiman, grants from the Arizona Commission on the Arts, and a scholarship to the Fine Arts Work Center in Provincetown. Originally from Hawaii, she now lives in Tempe. Gated communities are big in Arizona, but my neighborhood in Tempe goes one step further. We live behind thick, seven-foot walls that surround each of our houses—all in blatant violation of the Maricopa county fire code. It is the ideal place to live for nonflammable introverts. My husband and I are almost-perfect matches for the area, although some of our neighbors’ minds seem to be falling from the bone.